HITS » The Longines FEI World Cup™ Jumping North American League comes to HITS Desert Horse Park for a world-class day of equestrian show jumping. The Longines FEI World Cup™ Jumping North American League comes to HITS Desert Horse Park for a world-class day of equestrian show jumping. Thermal, CA (February 3, 2015): The spotlight will be on the world’s top riders as they compete for international fame and a $100,000 prize purse in the Longines FEI World Cup™ Jumping Thermal competition at HITS Desert Horse Park in Thermal, California. The event will take place on Saturday, February, 13 at 3:00 pm with a plethora of excitement in store. Spectators will witness the top riders and horses from around the globe contend for a shot to compete at the Longines FEI World Cup™ Jumping Final to be held in Gothenburg, Sweden, on March 23-28. This day of family-friendly fun is open to the public, and will host U.S. and international equestrian athletes as they prepare not only for the Longines FEI World Cup™ Jumping Final, but for the 2016 Olympic Games in Rio de Janeiro, Brazil. 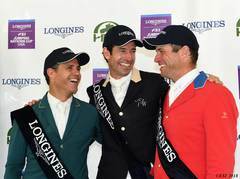 Riders to watch include Olympian Will Simpson, World Cup Champion Rich Fellers, and Hap Hanson, winner of over 100 Grand Prix, among others. The Longines FEI World Cup™ Jumping Thermal competition is open to the public. General admission tickets may be purchased at the gate on February 13 for $10, children 12 and under are free. The Longines FEI World Cup™ Jumping Thermal competition is at 3:00 pm. Come early and enjoy a full day’s schedule of jumping events in the Park’s 12 competition rings, browse the many vendor booths and enjoy the Park’s on-site food options. 85-555 Airport Blvd., Thermal, CA 92274. Entrance on Airport Blvd., just east of Harrison Avenue. Located less than 20 minutes from Palm Springs. For more information regarding the Longines FEI World Cup™ Jumping North American League qualifier, visit HitsShows.com.